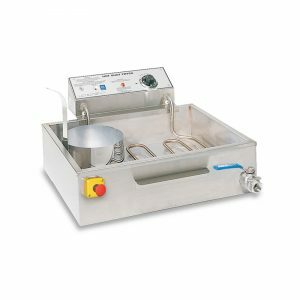 #8078 Deluxe Funnel Cake Fryer FC – 4 | Pronto Pup Co., Inc. This fryer can cook four 8″ funnel cakes or six 6″ funnel cakes at a time. High production ribbon-type heating element for more square inches of heating contact gives quicker recovery time. This unit has an oil pre-heated feature to safely heat the tank at start of production. 47 lb cooking oil capacity. 5500 Watts, 240 Volts, 30 amp plug. 22 1/2″W x 17 1/4″D x 16″H. Same cook surface as K6, 21″W x 15 3/4″D. Remote power switch mounts on side of tank.